Ironically, having to rush down to Bordeaux due to a family crisis has made me late taking part in the France Book Tours virtual tour for the latest in the Winemaker Detective series, in which Bordeaux has previously featured. Events were entirely beyond my control but here I am now, a little late and still stressed to the eyeballs, but delighted to be sharing this lovely book with you. 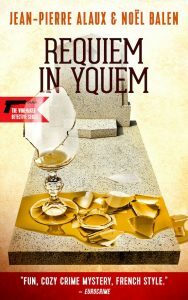 Requiem in Yquem sees Benjamin Cooker and assistant Virgile back in action in this newest wine-centred cozy mystery. This time we are in Sauternes region, where a brutal murder of an elderly couple has shattered the locality. Virgile has some history in the area, which comes in handy, and this together with a wine connection and Benjamin’s tenacity soon has them on the trail of the killer. As always with this series, there is plenty of good food and wine to relieve the dramatic tension, and also superb descriptive writing, and our two imperfect heroes with their problems and quirks keep these stories realistic and totally absorbing. Here’s an atmospheric excerpt so you can see for yourself just how enjoyable the writing of Jean-Pierre Alaux and Noel Balen (pictured above) is. It was a rustic bed. Resting on a pine frame, the thin mattress had served for more than sleep. Lovers had coupled in the night here, and children had been birthed in white-hot pain. Under the goose-down comforter, the sheets were heavy and rough. A crucifix above the bed attested to a faith filled with incense and rosary beads. A frond secured behind it awaited Ash Wednesday, when it would be reduced to gray dust—a reminder of mortality. An antique clock with a brass pendulum ruled over the dreary room, which was steeped in darkness day and night. Éléonore and René Lacombe were too discreet to let the sun reveal their furrowed faces, skeletal torsos, and arthritic joints. The couple anticipated death with resignation mingled with apprehension. On this late-autumn morning, the two old creatures were lying side by side, with waxy faces, half-closed eyes, gaping mouths, and limp, fleshless arms. Éléonore and René looked like marionettes abandoned by a puppeteer who had rushed offstage. Except for the blood. The bullets had been carefully aimed. Had Éléonore and René awakened? Had they seen the murderer’s face? Clearly, there hadn’t been enough time to switch on the lamp or let out a word or a cry. And certainly not enough to grab the shotgun below the bed, which René hadn’t used since he stopped pigeon hunting five years before. No, the scenario had unfolded without a hitch. No mess in the house. No closets forced open or drawers rifled through. The covers were even pulled up, as if to keep the victims from getting cold before moving on to the afterlife. Was it possible that someone was after the couple’s modest possessions? A postal employee’s pension, combined with the meager savings of a seamstress, was hardly enough to motivate a crime like this. They kept no wads of euros tucked beneath their mattress. The small savings they had managed to accumulate was safely deposited at a bank in Preignac, a commonplace town in the Sauternes appellation of southwestern France. The Lacombes’ nest egg was available for withdrawal if anything happened. But nothing ever happened. Theirs was a humdrum life permeated with silence, small grimaces, groans, and occasional laughter. Some bickering, of course, but nothing serious. Éléonore and René had sometimes joked that they would be inseparable even in death. And when the first officer on the scene carefully pulled down the covers, it was confirmed. Éléonore and René were holding hands. Here’s your chance to win a copy of this very entertaining mystery that really does keep you guessing right up to the end. The intricate taste of greed and remorse. The “addictive” Winemaker Detective series returns with a French mystery set in Sauternes, home of one of the world’s finest dessert wines, Yquem, known to some as liquid gold. In the mist-covered hills of Sauternes, where the wine is luscious and the landscape beguiling, the brutal murder of an elderly couple intrigues the wine expert Benjamin Cooker and awakens memories for his dashing assistant Virgile Lanssien. Drawn into the investigation, the two journey through the storied Sauternes countryside, where the Château d’Yquem has reigned for centuries. Will the murder go unexplained and the killer remain free? The Winemaker Detective’s discernment and incessant curiosity pushes investigators to look deeper, while Virgile rekindles memories of his days at school and questions the meaning of his life. In another satisfying wine novel with a French flair, authors Jean-Pierre Alaux and Noël Balen give readers a perfectly intoxicating combination French wine, gourmet meals, and mystery in the gloriously described Sauternes wine region with all the scenery, scents, and sounds of France. This light, fun mystery combines amateur sleuths, food, and wine in a wonderfully French mystery novel that doubles as a travel guide. It is a new kind read on the international mystery and crime scene: a pitch-perfect, wine-infused, French-style cozy mystery. and exhibits a real passion for wine and winemaking. For him, there is no greater common denominator than wine. which he coauthors with Noël Balen. making records, and lecturing on music. in addition to his prolific novel and short-story writing. Sally Pane studied French at State University of New York Oswego and the Sorbonne before receiving her Masters Degree in French Literature from the University of Colorado where she wrote Camus and the Americas: A Thematic Analysis of Three Works Based on His Journaux de Voyage. Her career includes more than twenty years of translating and teaching French and Italian at Berlitz and at University of Colorado Boulder. She has worked in scientific, legal and literary translation; her literary translations include Operatic Arias; Singers Edition, and Reality and the Untheorizable by Clément Rosset, along with a number of titles in the Winemaker Detective series. She also served as the interpreter for the government cabinet of Rwanda and translated for Dian Fossey’s Digit Fund. In addition to her passion for French, she has studied Italian at Colorado University, in Rome and in Siena. She lives in Boulder, Colorado with her husband. 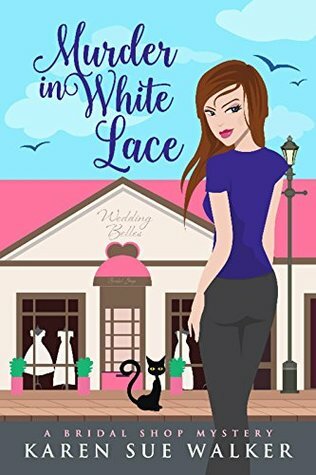 Posted in Book reviews, Cozy mystery, Ebooks, Fiction, Uncategorized.